Lieutenant Francis Stevenson was bom in Grand Isle County, Vermont, December 27, 1829, of Irish descent, and with his father’s family came to Centre County in the 50’s. 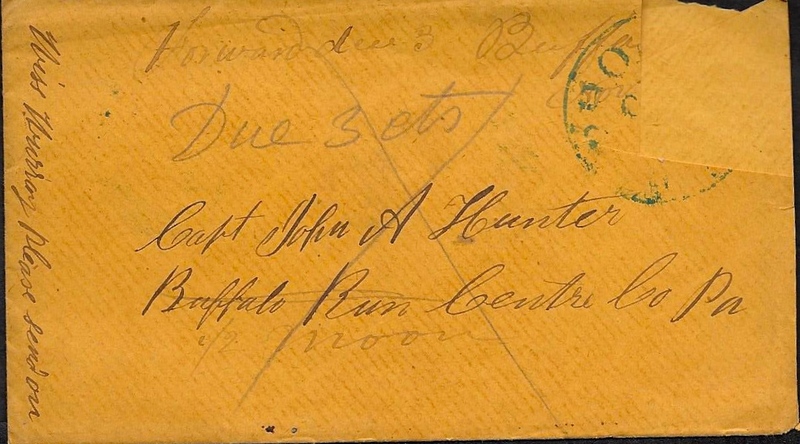 For two years following 1857 he was in the employ of the United States Government in charge of cattle at frontier posts and at the close of his service he rode home to Buffalo Run on horseback. On his return to Centre County he joined one of the several military companies, possibly that at Stormstown. When the 148th was being raised Captain Forster and Lieu tenant Bible were engaged in enlisting men for what afterwards be came C Company. They went to Stevenson’s home on Buffalo Run one Sunday morning before daylight and he agreed to help raise the company. Stevenson’s experience evidently suggested him as avail able material for an officer in the company. On its organization he was elected Second Lieutenant and commissioned by Governor Curtin. He was a man of sunny disposition and undoubted courage and is highly spoken of by those who knew him at home and in the Army. He was attacked with fever and sent home in the winter of 1863, some time in J anuary and got back to his Regiment, not fully recovered, a few days before the Army began to move in the spring. He was killed at Chancellorsville [on 3 May 1863]. Lt. Stevenson wrote the letter to Capt. John Andrew Hunter (1820-1916) of Halfmoon, Centre County, Pennsylvania. He was the son of John W. Hunter (1783-1839) and Elizabeth McIlvain (1786-1869). He was married to Elizabeth B. 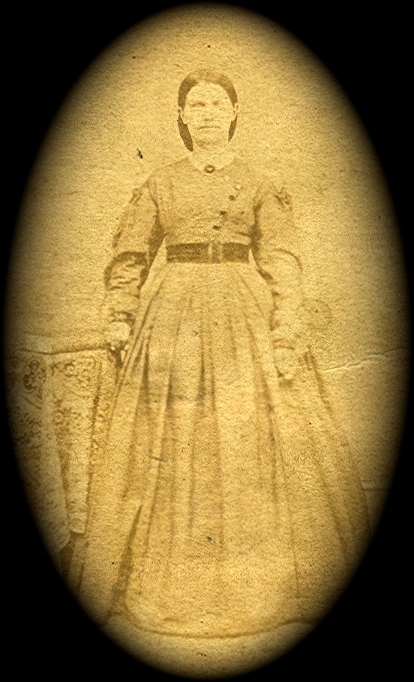 Elder (1824-1909) in January 1852. 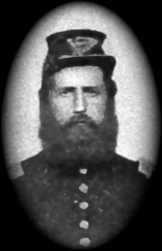 Captain Hunter gained his title by commanding several local companies in which many officers and men were prepared for service in the Civil War, although he himself never saw active service. In his early manhood, Captain Hunter taught for almost sixteen years in the public schools of Centre and Huntingdon Counties, beginning when about sixteen years of age. His interest in education was continued with the establishment of The Pennsylvania State College, as evidenced by his presence at all its commencements until within the last two or three years, when failing strength prevented his attendance. After writing 4 or 5 letters to you & getting no answer from any that I sent you, I will send you another. I received the letter that my wife requested you to write & the one that you sent by R. C. Peel and that is all that I ever got of you. I am very well satisfied that you have written several times to me but where they have gone, I cannot tell for I never got any but them 2 letters. This letter I will send to Buffalo Run & see if you will get it from there. The 2 letter that I received I answered in a day or 2 right after I received. There is several of our boys sick. Will Harpster is sick. ¹ I think he is all that is sick from your neighborhood except George Gates ² & he is very bad with that rupter. He can scarcely walk. He went down to Cockeysville the other day to get into the hospital & the doctors sent him back the same evening. They say that there is nothing the matter with him. The doctors think that he wants to get discharged so you may judge what pity there is for him here. He is the worst crippled man you most ever saw walking around. George Pottsgrove ³ is getting along very well. He is doing fine. I hope he will come out all right. He is a fine looking soldier. There is quite a time in this county about the draft. In old Centre, you are relieved of that trouble. Some here [are] running away & others are resisting the officers. We are guarding the railroad. We are camped near Phoenix Cotton Factory. Well Captain, it is pretty hard now. It is about 8 o’clock & [Capt. Robert I.] Forster & [Lt. William] Bible have gone to bed. I am getting cold. We are in tents and it is getting cool down here but it is nothing to the Eutaw trip as yet. But some of the boys thinks it very hard. We are scarce of bedding yet on account of having no funds to buy blankets but there is a prospect of being paid by the middle of next month. I wrote to Harrisburg about the first letter you sent me with that money in but never got answer. If I don’t hear from you tomorrow I will write again to Harrisburg but if it came there I suppose it has gone to the dead letter office before this. There is a collision on this road nearly every day. it is the unluckiest railroad I ever heard of. What the reason is, I cannot tell. I will send this letter to Buffalo Run thinking that you may get it. I have directed all to Half Moon but I will change this one to see if I cannot get it to you for this is the 5th or 6th letter that I have written to you and got no answer from any of them. Well I must close for the present. Hood night. I am well at present & hope that these few lines may find you & family all well. ¹ Will Harpster does not appear on the Company C roster. ² George Gates enlisted on 27 August 1862 and was discharged on a Surgeon’s Certificate 20 April 1863. ³ George Pottsgrove was drafted in August 1862 and transferred from the 148th Pennsylvania to the 51st Company, 2d Battalion Veteran Reserve Corps in November 1863. He was discharged in August 1865 at the end of his three-year term of service. This entry was posted on Sunday, June 29th, 2014 at 1:18 pm	and posted in Uncategorized. You can follow any responses to this entry through the RSS 2.0 feed.